Whether you’re chasing bass in the swamps, pike on the Shield, or steelies in the rivers, the Citori series gives you the versatility, power and performance needed to make your trip memorable! Equipped with exclusive Radial Tuned Braking, an externally-adjustable centrifugal cast control system that provides unprecedented accuracy, regardless of wind speed or lure weight— and beefed to the max with the Magnum Drag system rated for a whopping 12.3 lbs. of drag pressure on the top end. "I own 5 of these reels and cant say that i have a complaint yet. 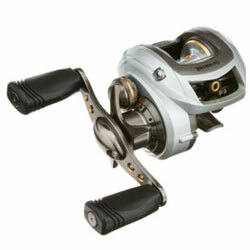 Overall - if you can pick this reel up on sale you can not beat the value." "This reel is amazing. i prolly caught around 50 bass on it last weekend at a powerplant lake. the only problem is you do get a blister on the side of your finger." "I own 5 of these reels and one Browning Midas. Best reels I have ever used. Smooth, cast a mile, and overall just great. I have recently gotten two of my fishing buddies onto these reels and each of them now own about 5 of them." "The real has a very iretating piece of plastic that starts to bother you when you fish all day"